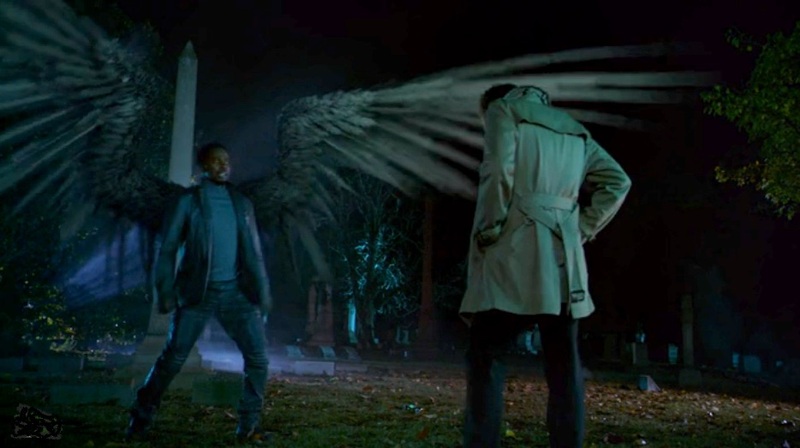 This week’s episode of Constantine marks the return of Ritchie Simpson, when some of Ritchie’s university students find themselves in another dimension with a homicidal scientist. 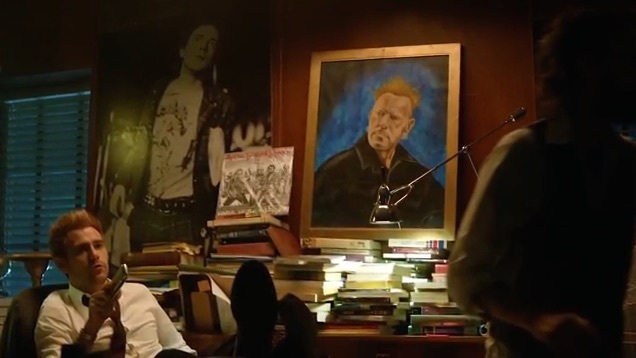 Ritchie only appears a few times in the first dozen or so issues of Hellblazer, and the TV show version is turning out to be perhaps more interesting than the book character. 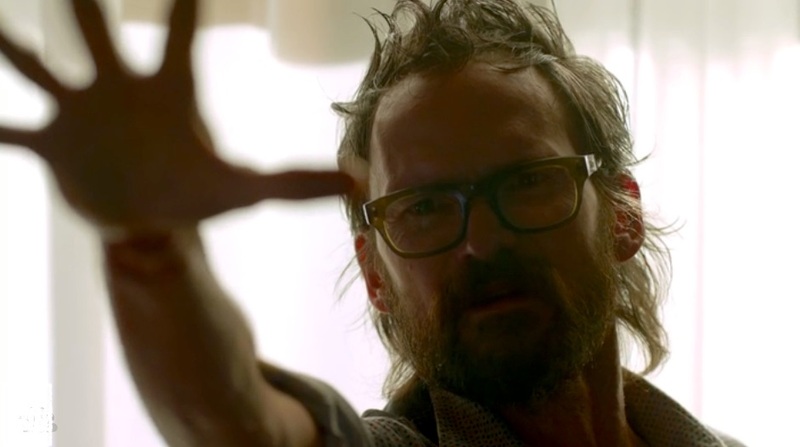 We really enjoy Jeremy Davies’ portrayal of the tech-minded, pill-popping Ivy University professor with an apparent fondness for John Lydon (and Constantine’s own old punk band, Mucous Membrane). 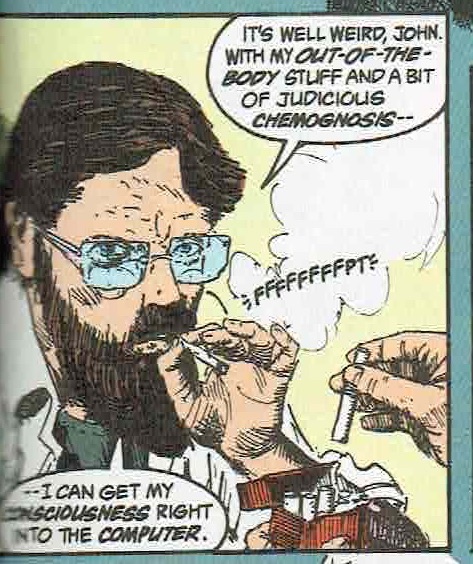 We also like it when Chas and Zed are elsewhere once in a while—John Constantine is not meant to have sidekicks. In the weekly one-line explanation of where missing members of the Constan-team are, we’re told that following the events of last week, Zed is on bed rest and Chas is off bonding with his family. Ritchie’s office, full of Johns: A 12″ Mucous Membrane single (perched atop a copy of Elephants on Acid), flanked by giant Johnny Rottens. In a classic horror movie opener, four college kids—Carter, Miranda, Adam and Lily—are drinking and giggling inside a mausoleum. Beeswax candles are lit, and Adam reads out an Egyptian incantation from the journal of one Jacob Shaw. As the kids repeat the spell, each of them opens their eyes to find themselves alone in different parts of a dark house. Some of them see other people, and the other people can see them as well. At the millhouse, John is listening to some Warren Zevon and having a maudlin moment and a drink with his dead friend Gary Lester. (Gaz isn’t there; he’s just visible in the mantelpiece mirror that reflects the past.) Manny (Harold Perrineau) pops in to tell John to get back to work—Gaz may be dead, but Manny suggests that John still has a living old friend nearby that needs his help—and pops back out again. There’s trouble at the university, and Ritchie is somehow involved. Carter, one of the students from the mausoleum, catches a reflection in a window on campus, and is transported back to the otherworldly house. Someone suffocates him in the house, and back on campus, Carter suddenly falls down dead of asphyxiation. At Ivy U, Ritchie lets a tape recorder give a lecture on Saṃsāra to his bored class. Do they even make portable cassette players anymore? That lecture must be from back in the 20th century. 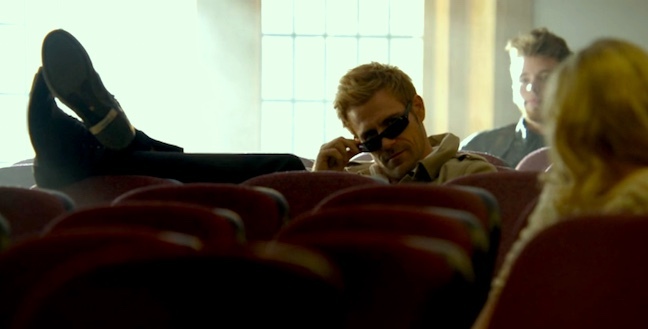 There’s a question from the back of the hall—it’s Constantine. There’s one in every class. John: In order to achieve liberation from the cycle of life and death, don’t you have to fulfill your life’s purpose? Ritchie: Liberation is a purpose; it’s a state of peace—a state of peace that I was really, really enjoying right up until this very moment. As with pretty much everybody else ever, Ritchie is very unhappy to be seeing John again. John had promised to leave Ritchie alone after soliciting his unwilling help to banish a demon in Episode One. As they talk in Ritchie’s office, Ritchie learns that their mutual old friend Gary Lester is dead, and John learns that Ritchie is no longer doing the computer-assisted data mining for evil hotspots he had been working on when they last saw each other. A call comes in from Adam, one of the other mausoleum kids. He is Ritchie’s teaching assistant, and is calling to cancel his office hours as his friend Carter has just died. Whether he wants to be or not, Ritchie is now involved. John and Ritchie head out to investigate—John swipes a notebook from a campus cop near the ambulance that has come to take Carter away, and learns that Carter died mysteriously. 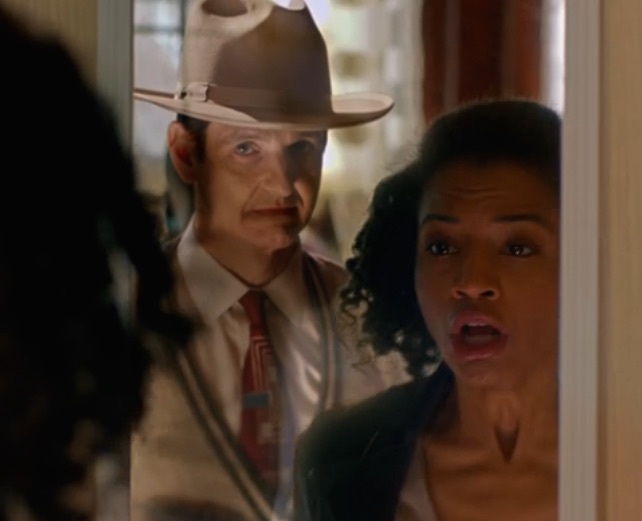 Adam and Lily are discussing Carter’s death when Lily sees a man in a mirror who matches the description of the figure Miranda saw in the spooky house. We also saw the man in the reflection Carter saw before he died. Miranda has taken cognitive psychology, though, and later at a candlelight memorial for Carter, she tells Lily it’s just group hysteria. Afterward, Miranda is in a dance studio—surrounded by mirrors!—when she finds herself back in the dark house, being hunted. A young man there tries to warn and help her, but he cannot do much, as his hands have been cut off. John goes to check out the mausoleum by following a trail of beer cans through the cemetery. Manny briefly shows up to say that he thinks Ritchie could be useful in the fight against the Rising Darkness. John sees the beeswax left behind from the students’ candles, and hieroglyphs that tell him that the kids must have experienced out-of-body trances through Egyptian dream magic. This is the clue Ritchie needs to realize what’s happened—Adam, his TA, has taken the private journal of Jacob Shaw (William Mapother, another Lost castmate of Davies and Perrineau) from Ritchie’s books in order to attempt Shaw’s Dream Temple technique of creating alternate worlds. Half a century ago Shaw was accused of killing his research assistant, but avoided prison when he fell into a catatonic state and died a few weeks later. 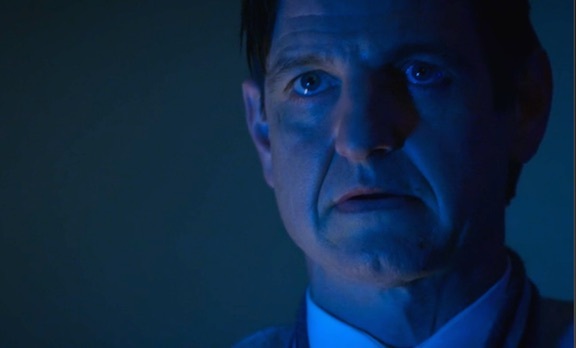 It is Ritchie’s belief that Shaw just transferred his consciousness to another dimension, singularity-style. Singularity theory has replaced occult data mining as Professor Simpson’s main topic of research, in part because the Rising Darkness has been making the amount of powerful evil in the world too big to try to keep track of. He’d rather be a lazy academic on a diet of prescription sedatives, studying ways to escape reality, than face the increasing horrors of this world. Adam the TA and Lily are growing more concerned about their friends and the weird visions they all experienced. Both intending to find Miranda, Adam will return to the mausoleum to try to re-enter the trance state while Lily goes to the dance studio to look for her. Adam enters the trance and finds Miranda in the dark house, stabbed in the abdomen. At the same time, Lily finds Miranda’s dead body on the floor of the dance studio in a pool of blood. John and Ritchie have arrived at the mausoleum, where they find Adam sitting, unresponsive. Suddenly, defensive wounds begin to appear on his arms—Adam is fighting Shaw in the alternate reality, and his physical body is bleeding from the attacks. As John and Ritchie try to somehow awaken him, Adam’s throat is cut in the dark-house world, and back in the crypt blood gushes from Adam’s neck. It is too late. Outside Bradstreet Hall on campus, the two occultists talk. Ritchie: This right here? This is—this is all my fault. John: Oh, spare me, will ya? You didn’t make Adam do the ritual. John: You are not Gary. Ritchie: I brought this into Adam’s life. You see what we are, John? To other people, we are what you call cancer. And we’re just spreading our disease. John: You know, when you’re done sitting on your bloody pity pot, we got work to do, all right? Ritchie: Pity pot. That’s—that’s good, John. Yeah, laugh it up, tell your jokes, but I’ll tell you something. You don’t fool me, man. Not anymore. I know your secret. I know what you pretend not to feel. You know why? ’Cause I’m feeling it right now. There is still one student left alive—Lily—and John needs Ritchie to buck up and help try to save her. The nightmare’s not over for her dead friends, either. They’re now together in the dark house—at least their consciousnesses are—and Jacob Shaw intends to chase them around his alternate reality like a bogeyman, reveling in their confusion and terror. John and Ritchie take Lily to Jasper’s, where the enchanted mirrors will not reflect the house of horrors to her. But just as Ritchie seems to be relaxing for the first time (he’s pretty chuffed about all the cool occult stuff to look at in the millhouse) and they are all fixing to have some stiff drinks, Lily pulls out her phone—the surface is reflective, and she immediately enters the catatonic state of a person trapped in Shaw’s reality. 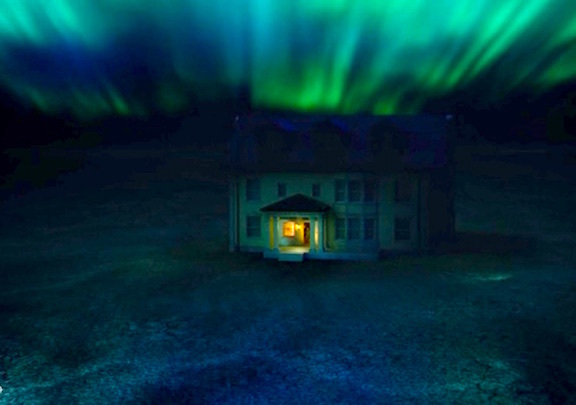 We see the dark house from the outside, standing alone in a world lit only by aurorae. John and Ritchie will have to perform the Egyptian ritual and go in after Lily. Unseen by Ritchie, Manny nevertheless shows up in order to watch over their catatonic bodies while John and Ritchie enter the trance state. Suddenly finding himself alone in the dark house, Ritchie follows the sound of a whistling teakettle to find John waiting for him. They hear footfalls upstairs and try to follow. When they reach a dead end, Ritchie finds that he is capable of overriding Shaw’s reality, and creates a door. They find a figure apparently crouching in fear under a bedsheet—it is the mystery kid who has appeared to the college students as another, earlier victim of Shaw’s—perhaps his dead research assistant? But the fear leaves the kid’s face and is replaced with a creepy grin as he slowly backs into the shadows, and is replaced by Shaw. Jacob Shaw proclaims that they and the students have invaded his private space. He causes slices to appear on Ritchie’s wrists, and flings nails through Constantine’s palms and into a wall, immobilizing him. Ritchie’s got skills! Who’s on the pity pot now? But Ritchie’s ability to change this reality saves the day. With the power of his mind, he creates a sun, which brightly lights the dark corners of Shaw’s dismal world. Shaw flickers and disappears, and the house begins to collapse. 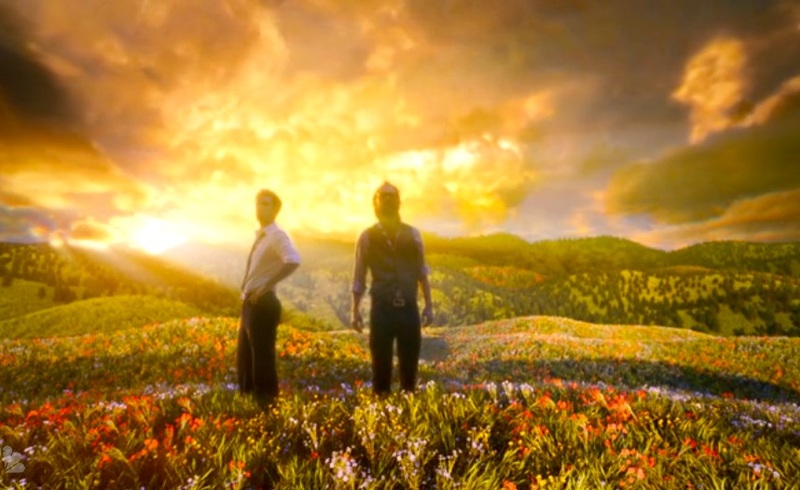 John and Ritchie run outside, where the world is turning verdant and bright. When they finally remember that Lily’s still inside, John goes to get her just as the dark house is crumbling away. Lily’s three friends say goodbye from inside the house—they are dead and cannot leave, but their souls are now free. By looking into Ritchie’s eyes, Lily is sent back into her body, still sitting motionless in the millhouse. Hey … guys? Guys? Where’s Lily? Ritchie tells John that he’s next to return, and that he himself intends to stay. The alternate reality is becoming more and more beautiful, and it would be the perfect place for Ritchie to hide from his memories of Newcastle and his unhappy life. John finds himself back at Jasper’s with Lily and the still-catatonic Ritchie. John watches Ritchie and hopes he will choose to come back to our mundane plain—and unlike the Ritchie Simpson in the comics, eventually he does. Back in a university lecture hall, Professor Ritchie Simpson puts his old tape recorder away, and begins speaking to his class about the idea of Nirvana. 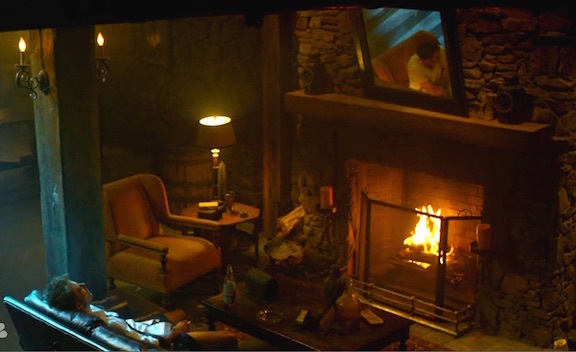 Meanwhile, back at Jasper’s, Constantine picks up where he left off, drinking with the past reflection of Gary Lester, as if they are two human examples of existential suffering and the thirst and desire that causes it. Despite the unknown, sometimes-handless young person wandering around Jacob’s dark house going largely unexplained, and Professor Ritchie perplexingly saying there are only three Noble Truths at the heart of Buddhist thought rather than four, we quite liked this episode. 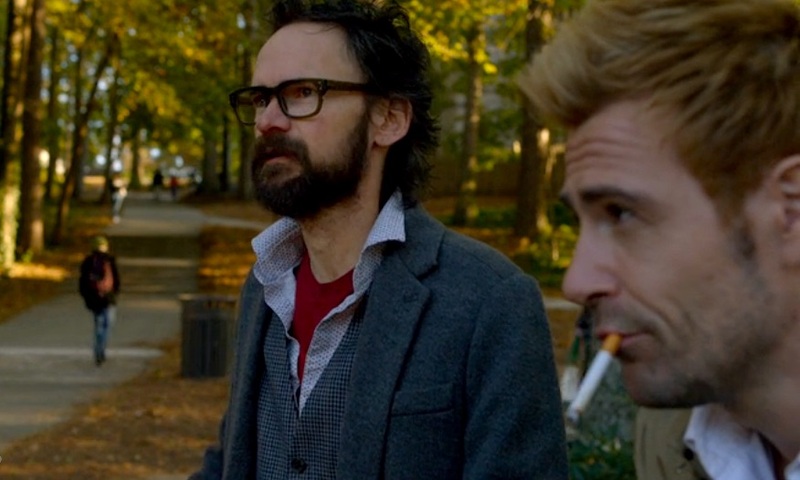 The backdrop of Agnes Scott College as Ivy University is lovely, William Mapother is as creepy as ever as Jacob Shaw, and we look forward to the possibility of seeing more of Jeremy Davies as Ritchie Simpson. 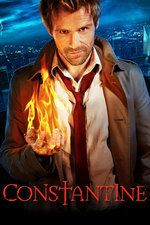 He is a great foil to Matt Ryan’s Constantine. Sláinte to John’s old friends, living and dead, whether they can stand his company or not. They’re winning, Momma, and it’s getting dark / D’you think there’s time to build an ark? Tomorrow’s a fiction, yesterday’s a lie / I had a friend, stuck his works in his eye / . . . Perhaps he’ll die?